I’m happy to announce that I’ve been selected to speak at GiantConf in Charleston, SC next summer. It is a tremendous honor for me to be included in such an incredible lineup. And to be completely honest, I’m nervous as hell. But I’m looking forward to embracing this challenge and being apart of something that could be pretty damn amazing. See you in Charleston in June! Web Afternoon is coming to Augusta. I’ve been toying with the idea of planning a conference in Augusta for quite some time. They’re a lot of work and I could never get the timing right. (And there’s the whole, I’ve never planned a conference thing.) And then J started Web Afternoon in October 2011. I loved the half-day format. I loved that he was able to pull it together in a month. Fast forward to last fall. J brought Web Afternoon to Charlotte with Bermon Painter. With local support and a great framework to base it on, I saw that Web Afternoon could go just about anywhere. 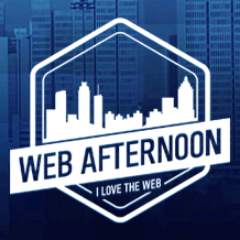 So, on May 18, Web Afternoon is coming to Augusta. Tickets are only $39 through March 16. I’m nervous and excited, but super happy to be bringing something so awesome to Augusta. I hope to see you there. Because of the experimental state of my site, you’re encouraged to view it using the latest version of Safari, Firefox or Opera. Once I’ve decided on a design direction, I’ll work on backwards compatibility. Thanks for your understanding. Feedburner’s been pretty spotty for me as of late so I’ll no longer be serving my RSS feeds through them. Please update your feedreaders accordingly. Sorry for the incovenience. If you’ve been experiencing slow load times while browsing my site, rest assured I am well aware of the issue. MediaTemple issued a notice earlier today that web and mail traffic was experiencing sporadic slowdowns. Hopefully the issue will be resolved soon. I’ve been toying with the idea of revamping the overall look of the site, but that takes time, and I already spend way too much time on the computer as is. Plus, I’m having a hard time coming up with something I like better than my current design. So, it’s realignment time again. Rather than reinvent the wheel, I’m going to make it better. Having said that, here’s your warning: Things are going to definitely start breaking on the site over the next few days. Please pardon the mess.